Chronic pain can be best understood from a biopsychosocial perspective through which pain is viewed as a complex, multifaceted experience emerging from the dynamic interplay of a patient's physiological state, thoughts, emotions, behaviors, and sociocultural influences. Current psychological approaches to the management of chronic pain include interventions that aim to achieve increased self-management, behavioral change, and cognitive change rather than directly eliminate the locus of pain. Benefits of including psychological treatments in multidisciplinary approaches to the management of chronic pain include, but are not limited to, increased self-management of pain, improved pain-coping resources, reduced pain-related disability, and reduced emotional distress - improvements that are effected via a variety of effective self-regulatory, behavioral, and cognitive techniques. At CareFirst, we believe your behavioral health is just as important, if not more important, as your physiological or pathological condition. We need the support of others who experience and understand chronic pain. Recognizing emotions helps us to understand ourselves. While our pain is certainly not all in our heads, attitudes and expectations do make a difference. Learning how to relax is essential. It helps prevent tension and redirects our attention on to other things we have some control over. Staying active, within realistic limits, can help us remain flexible and strong and reduce our sense of suffering. It is important to set realistic goals and chart our progress toward them. Chronic pain not only involves the person with pain, but the family as well. Hearing others talk of similar feelings and experiences caused by pain reduces our isolation. Half the battle is won when you begin to help yourself. 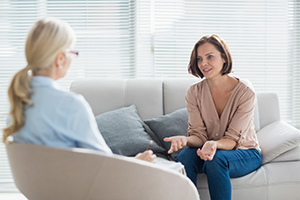 A patient receiving chronic opioid therapy at CareFirst may also be recommended for behavioral therapy consultation/treatment to assist with overall treatment, functional goalsetting, and psychological health.